A third-party app is looking to fix the problem, or at least pressure Tesla to finally release the feature. The app is called “Superchargers For Tesla” and it sources information from the dynamic database of SuperCharge.info, which has been the gold standard for Supercharger information for years now. We ourselves have been using the site when reporting on Supercharger news. Superchargers For Tesla offers all the same features as SuperCharge.info, such as variable range circles and Supercharger status, but it also adds check-ins, photos, nearby points of interest, discussion forum and user comments for each Supercharger. The developers, Ndili Technologies, Inc, hope to build on its user-base using the check-in features in order to provide near-real-time status for the Superchargers. Most of the time there’s always at least one available stall, but the feature is useful even if it’s just for that one time it can notify you so that you can try to find an alternative and save some travel time. 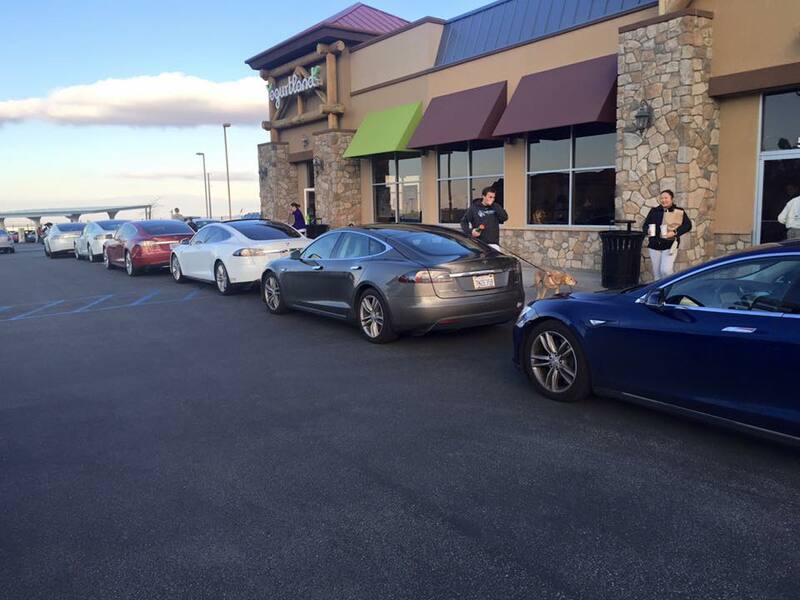 Especially during the holidays when Superchargers on popular routes can get crowded – Model S owners have reported over an hour and half of wait time at the Tejon Ranch Supercharger after Christmas (above).